We stock Petway and believe that they are a great Australian made product available in 3 sizes 6 colours. 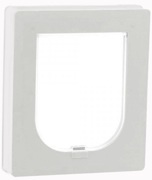 They are so easy to install, that there is no need to remove the door from its hinges or track. Flap size - 240mm high, 190mm wide. Features sliding lock clips to keep your pet in or out.